We get your website online! 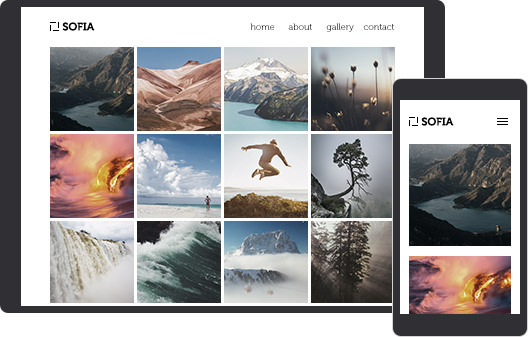 unique features to help you create a professional website. 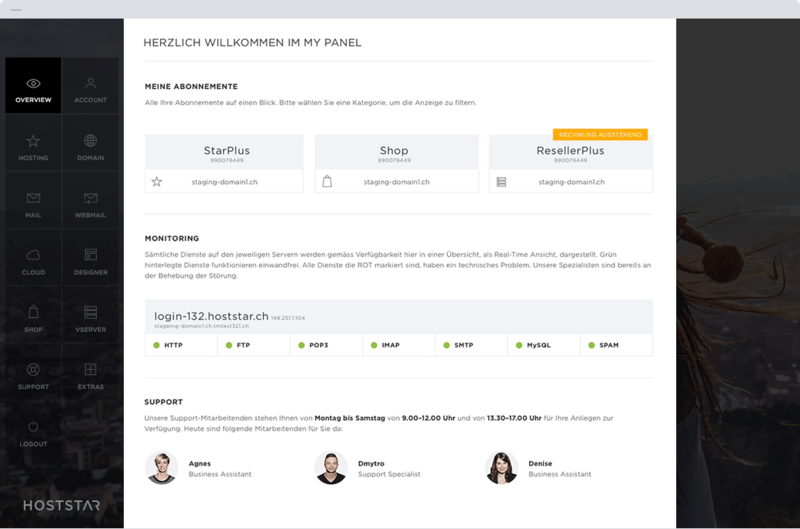 My Panel from Hoststar: a feature-rich and intuitive tool that gives you a complete overview with just one login. Taking care of all products, email and domain administration, invoices and commissions is child’s play. 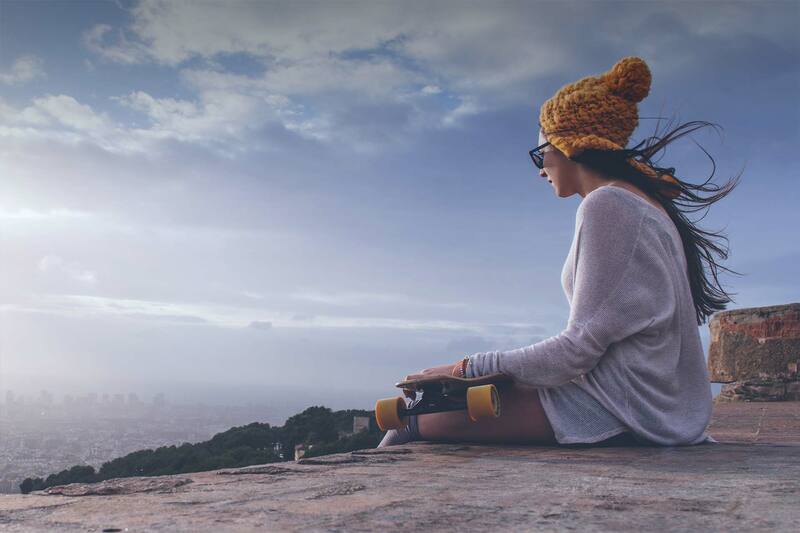 Save your files, photos, music and videos to your personal Cloud from Hoststar. You can access it from anywhere in the world. 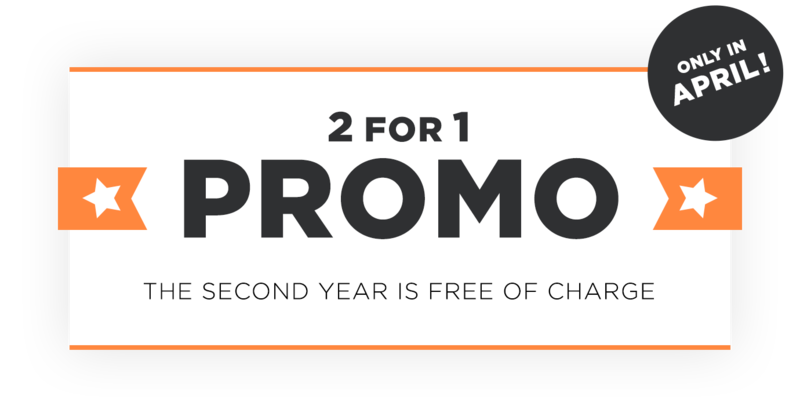 Your own personal Cloud is included free of charge in every hosting and website package. Hoststar’s MailPro is the perfect communication solution for those who want more than a standard email application: seamless synchronisation of emails, contacts and calendar entries on all devices, enhanced groupware functionality by means of the intuitive webmail and an integrated archive function. 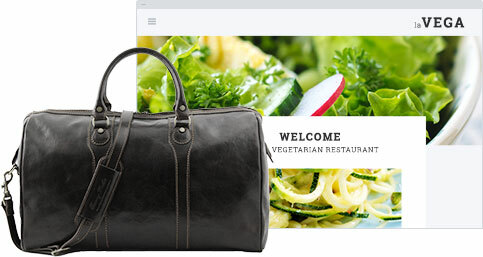 Create your professional website in no time at all with Designer from Hoststar. Thanks to individual editing options for tables, buttons, colours and images, you can use our editor to shape your website exactly as you want it. Just move text and images where you want them using drag & drop. Professional web design with no programming knowledge. With our professional designs, your new website is just a few clicks away. Choose a design, modify it, publish it. It’s that easy. Smartphones and tablets are being used more and more for surfing the web. That’s not a problem for Designer. 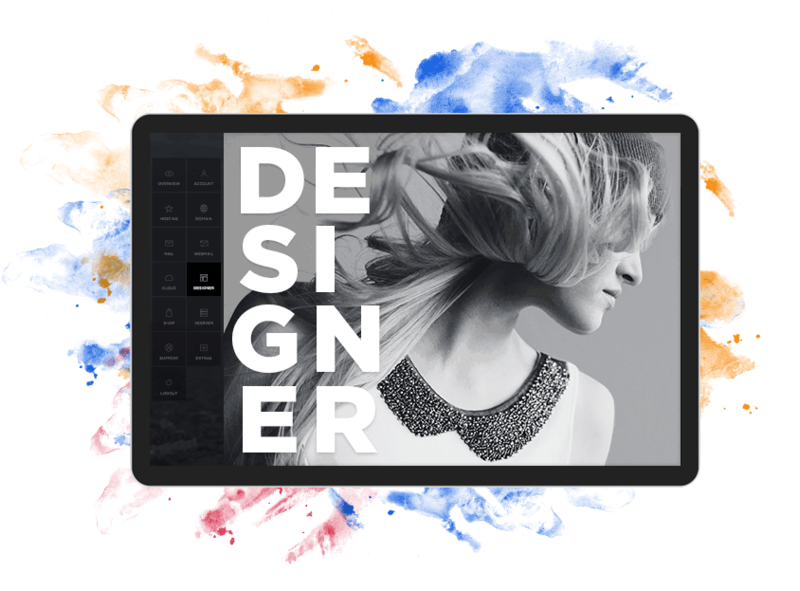 All its designs are 100% mobile-ready and will look just as great on smartphones and tablets as they do on PCs and notebooks. Start over with your own online shop now. 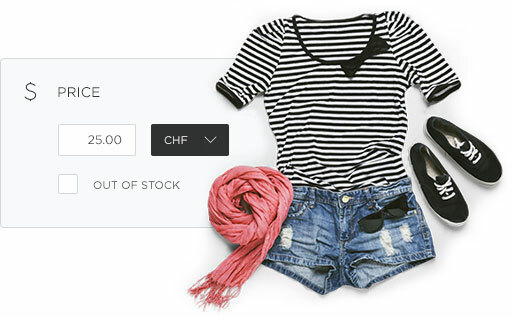 With Shop from Hoststar, the first step to your own online shop is easier than ever: Create your shop in just a few clicks. Select one of our high-quality designs and fine tune it to fit your taste. Enter your products. Which domain would you like? The right domain is critical to the success of your website. Buy your dream domain today, before it’s too late. Don’t have the right domain name for your professional website? 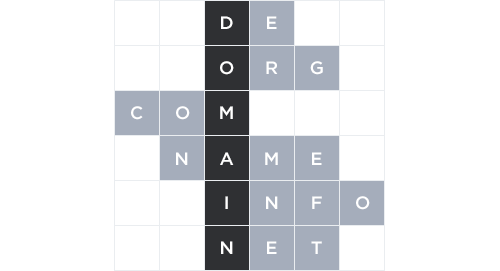 Hoststar’s Domain Wizard creates suitable domain names from the key words you enter that define your planned website. The suggested domain names are checked for availability automatically. Offer your customers domains for registration with over 400 domain extensions. In the Domain Manager in the reseller panel, it’s easy to manage your customers’ domains. Become a web hosting provider today! Our reseller products make it a breeze to get started as a web hosting provider. Choose the appropriate package and enjoy all of the benefits of professional web hosting – without expensive investments in infrastructure! You can set up and manage all your customer contacts centrally in My Panel. As a reseller, you operate as an independent web host service separate from Hoststar. There's nothing more customisable than a vServer. Virtual servers from Hoststar let you realise your perfect system. High performance, immediate availability, countless configuration options and fully in your control. We provide you with comprehensive monitoring and detailed statistics for keeping a close eye on your virtual servers. In My Panel, you can add port checks to your monitoring system that are then checked at regular intervals and displayed in real time. You can also keep an eye on network traffic thanks to the statistics tool. Our tools keep you posted at all times. Do you have a question? Do you need some help building your website? Hoststar’s Coach connects you with professionals who can support you as you create your site. Hoststar’s Move carries out your migration from another web-hosting service to our web servers. You’re free to take care of other business. With our hosting package, you can take advantage of countless fully automated, installable programs for running forums, content management systems and blogs.